As we head into the weekend, I'm just happy with the slow drop in temperature... after a few days in the triple digits, 85 degress never felt better. With that, I'm shifting gears and getting in the mood for fall with this classic. Everyone has their own version of it... some go a little overboard (in my opinion) and add way too much to a drink that should essentially be quite simple. I've dialed in my approach and found the perfect balance of sweet and bitter for my taste, along with the handful of friends that I've shared it with. 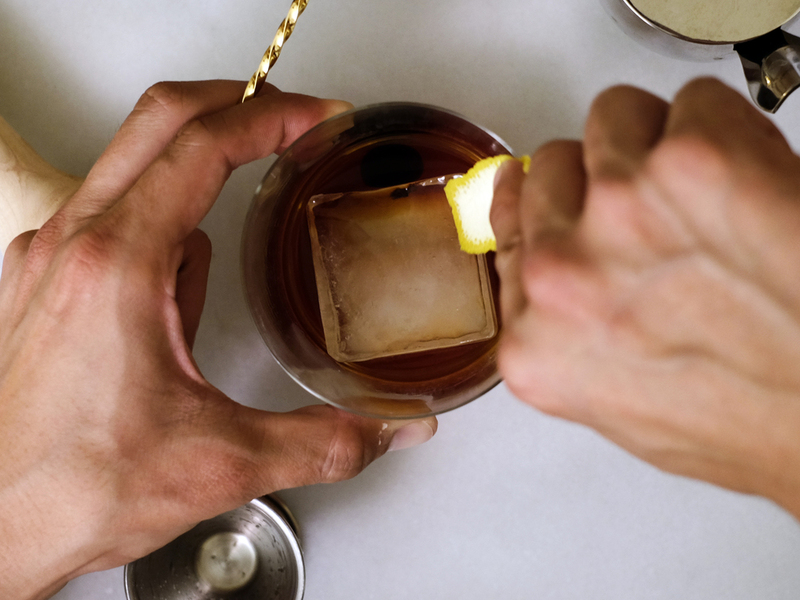 The real trick to getting this drink just right happens at the beginning of the process. It's all in the bitters + sugar mix... put that muddler to work and muddle those two ingredients into a smooth syrupy consistency. Feel free to use your favorite bourbon in this mix. My go-to is typically Bulleit, but for today I'm working with some Blantons Bourbon which is a newfound gem. Because of this drink's simplicity, the ingredients you use is key... especially the cherries. Luxardo Maraschino Cherries are a must. Not to be confused with those bright red cherries typically found on banana splits or milk shakes. Keep those on the desserts. The real Maraschino Cherry is dark red and comes sitting in a jar full of it's own dark syrupy juice... used as a way to sweeten your Old Fashioned to your liking. Alana's taste calls for two and a little extra syrup, while I stick to just one with little to no juice. The finishing touch is almost if not equally as important as the first step. Get that orange peel and twist that zest out right over your drink and give the rim of the glass a good rub to complete the overall experience. Put about half a teaspoon of sugar in the glass. Add 5-7 dashes of bitters over the sugar. Muddle the two ingredients until they combine into a smooth syrup... more muddling the better. Add 2 ounces of bourbon. Spoon cherry (or cherries and a little syrup) into the glass. Slice a good sized orange peel and twist it above the glass to release the citrus oils into your mix. Add your large cube of ice and stir for about 15 seconds. Rub the orange peel around the rim of the glass and add to the drink as garnish and serve.